One down... too many to go...: A 10K? Awesome. At Disney? Even better. I got it. BUT... you get to run through Disney World! C'mon, how cool is that? I've been volunteering with the Volunteer Services Team, a small part of Disney Sports and Recreation (the big department in the sky that is responsible for putting on all these awesome events every year), since 2004. From the Marathon to the Cross Country Classic, Special Olympics to Muddy Buddy, I've had the opportunity to volunteer in numerous capacities at all kinds of events. It's a lot of fun. But to actually PARTICIPATE? Now, that's something I don't get to do too often. My first Disney race was on March 30, 2003, just a couple of weeks before I would start calling myself a Cast Member. 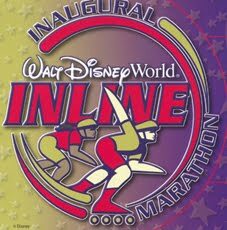 The Walt Disney World Inline Marathon and Half Marathon was probably one of the coolest endurance events I have EVER participated in. Sadly, the race made it's final roll in 2007, losing it's place due to a lack of popularity and to make way for the new Minnie Marathon the following Spring. Although a few pros did make their way out to the event, low participant numbers ultimately caused it's demise. 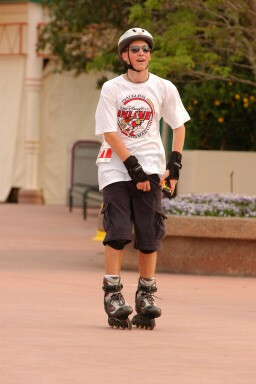 Walt Disney World Inline Marathon, how I miss you so. I didn't participate in a Disney race again until this past February (as I had mentioned earlier), but it was great to be back. The ESPN The Weekend 5K was so much fun! True, it wasn't on inline skates, but was still fun to run through the Studios early in the morning. 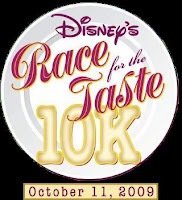 Getting to the real point of this post... this past Sunday brought Disney's Race for the Taste 10K and 3K, inspired by the Epcot International Food and Wine Festival occurring during the event. However, like the Inline Marathon, it has now come to an end. Sad day. Fortunately, I was able to register and race the 10K (that's 6.2 miles for you non-runners) in this, it's final year. Although a somewhat popular race, I'd just have to assume that it hasn't been making the revenue Disney wants to keep justifying its existence. So, it will not be returning next year (along with the Tower of Terror 13K and 6.5K, which I'll be running in next week - stay tuned), but will be replaced with an all-new event in 2010. Check out disneyenduranceseries.com on Wednesday at 3PM for the announcement. (Yes, I already know what it is, but I don't want to get fired by revealing it on here). Anyway, the race was SO MUCH FUN! Matt and I ran it together, with him pulling ahead of me about 2 miles in. We wound in and out from Wide World of Sports Complex to the Studios, Yacht and Beach Club and finally, Epcot. I managed to finish it in 56:12, which is about a 9.5 minute/mile pace - just what I was hoping for! Mom was there to cheer me on at the finish line, as well as help me sample some of the food brought out from the festival. All the finishers even got a cool medal! I really wish it was coming back next year, but I'll always have the amazing memories. To sum up... Disney races are incredible experiences full of magic in every mile! I can do it, so why don't you give one a try? If you're not into the whole "beating your body up for personal satisfaction" thing (and I mean that in a GOOD way), try volunteering as a Sports Enthusiast. Not only do you get to help out the participants as well as a deserving beneficiary, but you can make friends and earn credits towards free Theme Park tickets! Check out disneyenduranceseries.com and disneysportsenthusiast.com today.